As a fitting reflection of the world’s whisky scene, London’s Whisky Show scaled up dramatically for its 10th anniversary last weekend (29-30 September). Angus MacRaild reports from a plastic-free show that explored future trends and gave a guest spotlight to rum. If this year’s Whisky Exchange Whisky Show was meant to represent the future of whisky then perhaps the most notable thing we should expect is scale and expansion. 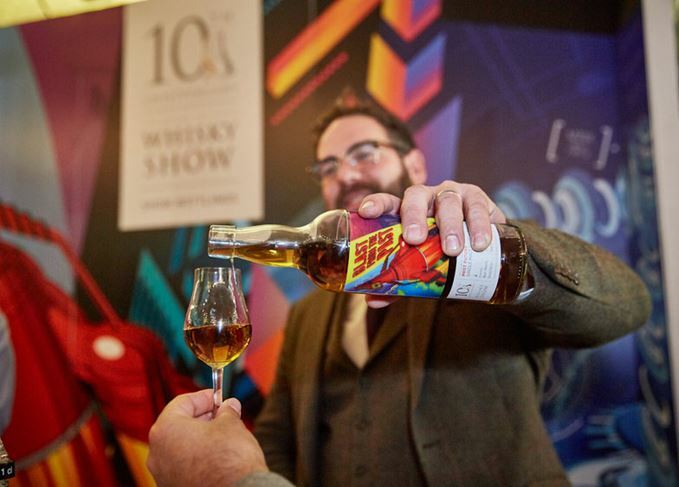 This year was notably bigger and busier than previous shows – a fitting and purposeful statement to celebrate the 10th anniversary of the Whisky Show. Not to mention a remarkable feat of behind-the-scenes organisation, logistical nuance and expertise. Over the past couple of years at London’s Old Billingsgate the show has made good use of the space on the venue’s ground floor. An ordered sprawl of exhibitors lined beneath the lofty brickwork, which was airy and navigable; a long way from the hemmed sweat box of previous venue Vinopolis. This year saw the show assimilate the upper level where food was served in previous years, as well as the lower floors. It is perhaps a neat metaphor for the slow but steady cultural expanse of whisky. There was a moment at the start on Saturday where there might have been temptation to think that it was perhaps too much. That it was getting to that ‘slightly too busy’ point. However, the use of the space remained smart and functional. Visitors rarely coagulated around one stand or jammed up a key route. There was still a free-flowing and logical nature to everything – something which works on multiple levels as it keeps exhibitors happy and makes for a better and more comfortable environment for everyone, which is conducive to tasting and enjoying whisky. While the theme of the show might have been future trends, one aspect of whisky’s future, which is already very much here to stay and was in evidence throughout the show, was investment. Bottlings such as the Chichibu London Edition and a show exclusive Ardbeg 18-year-old sold out at the shop about as quickly as staff could process transactions, the latter with a price tag of £300. There were discussions about investment between exhibitors and consumers, ones which demonstrated an increasing recognition of the complexity and depths of the subject. People clearly still have a ravenous hunger for whisky, not least for sought-after bottles with clear lucrative potential, but there also seems to be a more relaxed philosophical mentality about it. One which recognises that this new environment is here to stay and that it is possible to try to participate in whisky financially while also enjoying it for what it is: a drink. It is understandable that The Whisky Exchange would seek to format each show in terms of themes: art, legends, the future etc. Such categorisation is useful for the essential promotion and marketing which underpins the show’s success financially. However, there is a tendency for these themes to smack of novelty on occasion, to feel forced rather than natural. Exploring the future of whisky is all well and good, but futurism is haphazard at the best of times. Whisky’s future cannot be represented by novelty cartons, which were being handed out in the Future Trends Lab. Whisky’s future is surely the people attending the show and the vast multitude of exhibitors, independent bottlers and distillers, both old and new, that come together to celebrate and promote the spirit. This is a minor criticism though. The increasingly thematic nature of the show is a neat way to inject some fun. But going from stand to stand, dram to dram, conversation to conversation, you are reminded that the nuts and bolts of this show are what make it a success. Its on-going strength lies not in its efforts to change and drape itself in new clothes, but that it succeeds each year in what it does best. That is what people keep coming back for. It is social, open, inclusive, positive – it does not sneer at the new, pander to the wealthy or exclude the expert. It tries to be the broad church – all things to all whisky lovers. It is in this guise that it succeeds. The efforts to inject themes are at worst a novelty distraction and at best amusing and fun. But the core of the show remains stalwart and undimmed and long may that be the case. Where the future trends aspects really worked tended to be in ways that placed whisky in context of the wider world. This was the first plastic-free show for instance, a vital and progressive step that reminds us that whisky, like all industries and products, must transform its environmental impact. This was further underscored by the rather dazzling charity auction bottles on display in the vaults beneath the exhibition floor, the proceeds of which will go to Plastic Oceans. Elsewhere in the Future Trends Lab run by Scotchwhisky.com, there were other genuinely intriguing insights into things such as non-alcoholic whisky – something which might sound oxymoronic but as increasing numbers of younger people eschew alcohol from their lives, this offered a glimpse into how whisky might find a place for itself amongst teetotallers. Although for more traditional whisky lovers, perhaps the best thing in the Lab was the chance to taste InchDairnie’s maturing Scottish rye – a grain which seems to increasingly be charming its way into European distilleries. However, it wasn’t just cask samples that nodded to the future. This show had more new whiskies available than any before it. From Karuizawas to a bewilderingly heavily peated Kilkerran (due to launch early next year) there was almost too much to try. Enough that The Whisky Exchange might want to offer empty sample bottles for sale next year so visitors can take drams away with them. The 1cl examples sold at the company’s Old & Rare show in Glasgow would likely be a popular addition given the sheer volume of exciting whiskies on offer. The tastings were similarly rich in variety. From Port Ellen with Georgie Crawford and Colin Dunn, to Signatory with its lesser-spotted owner Andrew Symington – on vocal and amusing form. Similarly it was great to see the likes of Jackie Thompson of Ardbeg get a chance to enjoy a little limelight and recognition beyond the distillery visitor centre. Also notable was the fact that The Whisky Exchange co-founder Sukhinder Singh took to the stage with Velier owner Luca Gargano for a Rum vs. Whisky debate. In the end, the Rum vs. Whisky contest was declared a draw, perhaps too easy a conclusion but it leaves the space open for rematches. Given that rum is increasingly being drawn into whisky’s cultural gravity this is perhaps no bad thing. It was good to see rum seriously represented at the show this year as a guest spirit, illustrating that it is beginning to encroach on the mind and palate of the whisky drinker. Indeed, a pair of official Longponds in particular stood out as personal highlight drams. The debut show in Glasgow was overflowing with some truly once-in-a-lifetime drams.